Catalonia chicory chicory Of Galatina Sel.Franc. 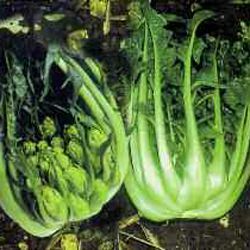 GALATINA CATALOGNA PUNTARELLE CHICORY SEL. FRANC. Galatina Puntarelle chicory is a typical Salento’s variety (South Puglia zone) Good vigorous plant, erect with thick leaves. White and large ribs form a big head where inside puntarelle fruit is shaped like a pine cone. Sowing from the end to July to August for autumn-winter harvesting.